Khichar is a fruit of Chinese origin. It can be seen growing wild along roadsides and saline deserts and sands at altitudes ranging from 400-3000 m in Afghanistan, Kazakhstan, Kyrgyzstan, Mongolia, Pakistan, Russia, Tajikistan, Turkmenistan, Uzbekistan, SW Asia and in some parts of Europe. In India, it grows at high altitude areas of Kashmir. Shrubs 20-50 (-100 cm) tall, copiously armed. Stems much branched; branches grayish or whitish, erect, ascending, or prostrate; branchlets apically thorny; thorns 3-15 mm, inserted on nodes. Leaves subsessile, solitary on young branches, in fascicles of 2-6 on short shoots in older growth; leaf blade grayish, succulent, linear or subcylindric, rarely linear-oblanceolate, 0.5-3 cm × 2-7 mm. Flowers 1 or 2 on short shoots; pedicel 5-10 mm; calyx narrowly campanulate, 4-5 mm, irregularly 2-4-lobed, lobes sparsely ciliate; corolla pale purple, funnelform, ca. 1.2 cm; lobes oblong ovate, 1/3-1/2 as long as corolla tube, not ciliate; stamens slightly exserted; filaments sparsely villous above base. Fruit globose, sometimes emarginate, purple-black when ripe, 6-9 mm in diam. 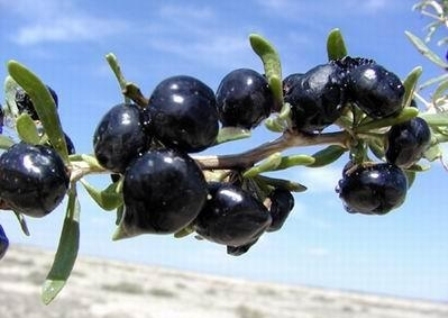 The fruits are sweet in taste and are eaten by local people. However, the flavour is somewhat mawkish. 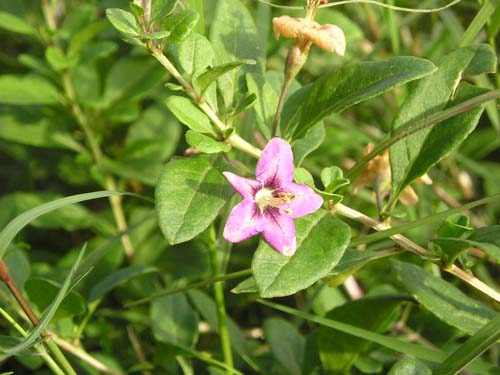 Khichar shrub is reported to contain an appreciable amount of alkaloids. 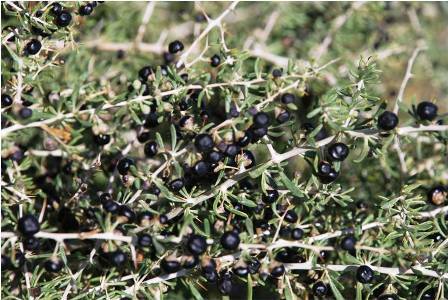 It is reported to be useful in the treatment of blindness. 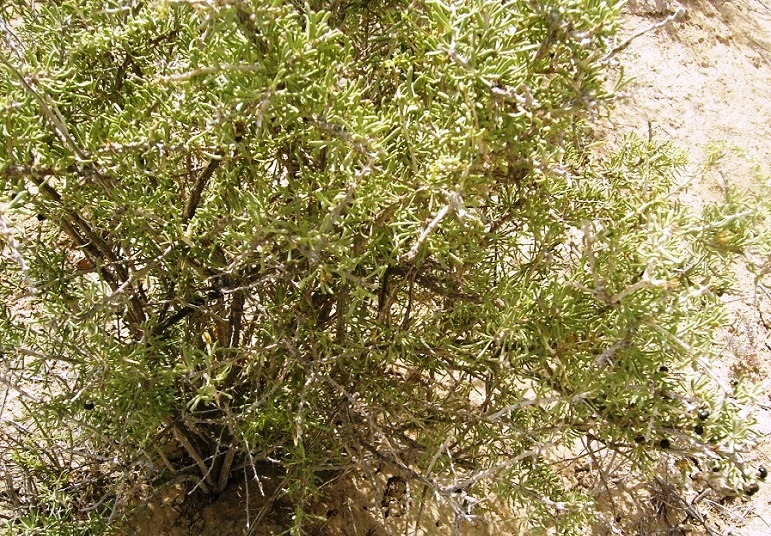 Khichar is a drought-enduring shrub. It is very much suitable for planting on hill slopes or along riversides to control soil erosion.